Build a pizza. Build a career. Thank you for your interest in a job with Azzip Pizza. We want Azzip to be a great place to work, that is why we offer excellent pay, advancement opportunities, a free pizza with every shift, and other great benefits. Please take a few minutes to tell us a bit about you. WHICH STORE WOULD YOU LIKE TO WORK AT? WHY WOULD YOU LIKE TO WORK AT AZZIP PIZZA? 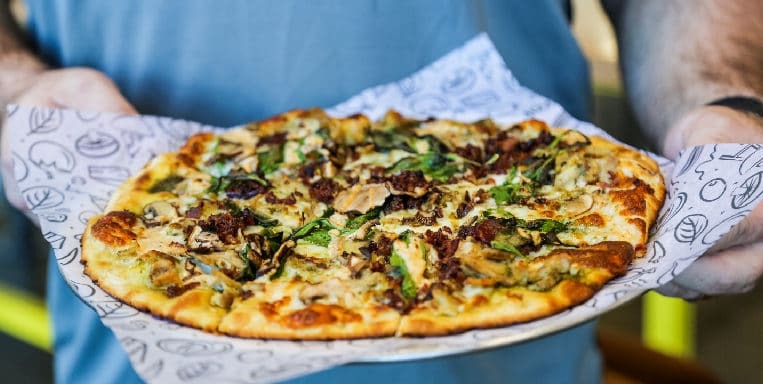 HOW DID YOU HEAR ABOUT A POTENTIAL JOB WITH AZZIP PIZZA? WHAT SCHOOLS HAVE YOU ATTENDED OR DO YOU CURRENTLY ATTEND? WHAT IS YOUR WORK HISTORY LIKE? FAVORITE JOB? LEAST FAVORITE JOB? TELL US ABOUT SOME OF YOUR GOALS. HAVE YOU BEEN TO AZZIP? WHAT'S YOUR GO-TO ORDER? DO YOU HAVE ANY REFERENCES? IF SO, PLEASE LIST ONE OR TWO. I CERTIFY THAT THEFACTS CONTAINED IN THIS APPLICATION ARE TRUE AND COMPLETE TO THE BEST OF MYKNOWLEDGE, AND UNDERSTAND THAT, IF EMPLOYED, FALSIFIED STATEMENTS ON THISDOCUMENT ARE GROUNDS FOR DISMISSAL. I AUTHORIZE INVESTIGATION OF ALL STATEMENTSCONTAINED HEREIN AND THE REFERENCES LISTED ABOVE TO GIVE YOU ANY AND ALLINFORMATION CONCERNING MY PREVIOUS EMPLOYMENT AND ANY PERTINENT INFORMATIONTHEY HAVE, PERSONAL OR OTHERWISE, AND RELEASE ALL PARTIES FROM ALL LIABILITYFOR ANY DAMAGE THAT MAY RESULT FROM FURNISHING THE SAME TO YOU. I UNDERSTANDAND AGREE THAT, IF HIRED, MY EMPLOYMENT IS FOR NO DEFINITE PERIOD AND MAY,REGARDLESS OF THE DAY OF PAYMENT OF MY SALARY, BE TERMINATED AT ANY TIMEWITHOUT PRIOR NOTICE. Please type your name to act as your digital signature.